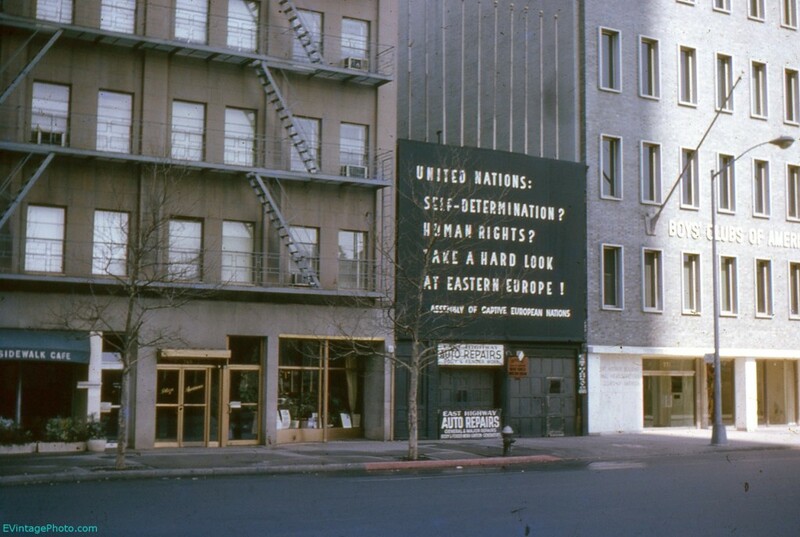 This 35mm slide from 1965 is simply labeled “Across the street from UN building.” It depicts a U.N. Protest Sign erected on a building across the street from the U.N. Assembly building in New York City. This building is long gone as the entire block has been rebuilt from the ground up. But it makes one wonder about the owner of “East Highway Auto Repairs” and what exactly his issue with the U.N. was, and if he was involved with the Assembly of Captive European Nations or if he just rented out the space on the roof of his building. Vintage photo from 1965 – UN Protest Sign outside of the UN building in New York. Take A Hard Look at Eastern Europe! The Assembly of Captive European Nations were a group of people from Eastern European government and cultural positions who were trying to liberate the nations of Albania, Bulgaria, Czechoslovakia, Estonia, Hungary, Latvia, Lithuania, Poland and Romania from Communist rule. The organization folded in 1972 due to a lack of funding, but until then it provided information about conditions behind “The Iron Curtain,” to members of Congress and the United States Government.